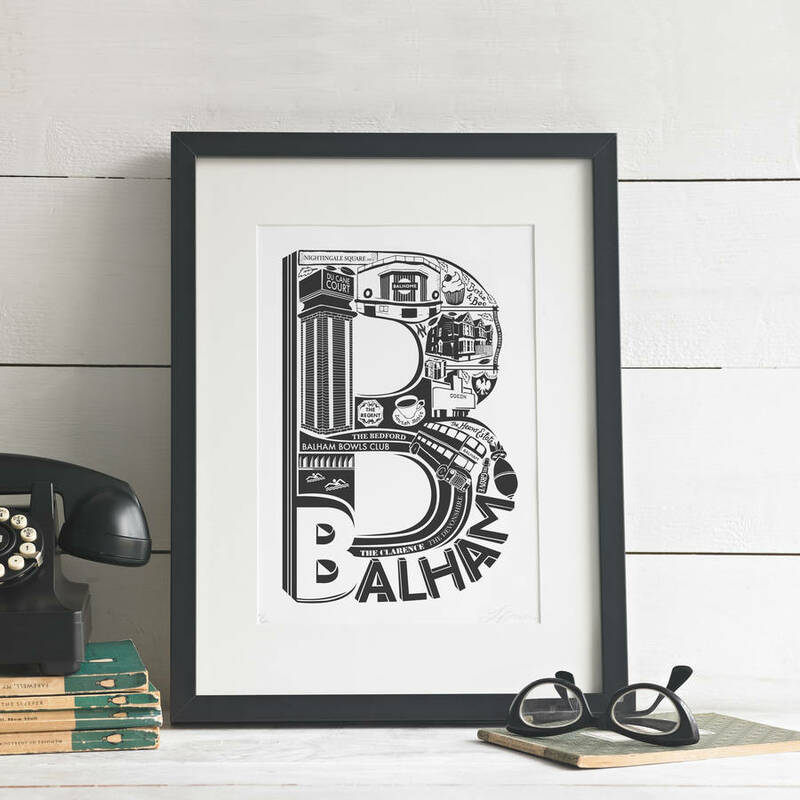 Incredibly intricate illustrations showcase Balham's best bits in this lovingly screenprinted artwork, which cleverly incorporates some of Balham’s iconic architecture and best-loved pubs. This is a limited edition, each print is signed and numbered. Please allow an extra 3 days for framing. 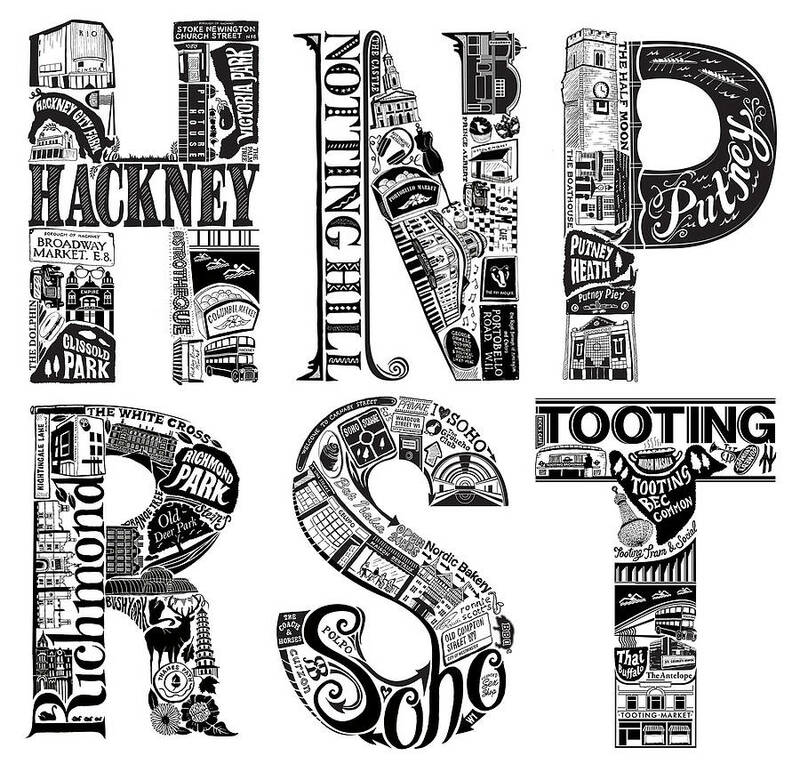 Hanging this artwork on your wall would be a great way to celebrate the area you live in, or to remember a part of London you've just left. 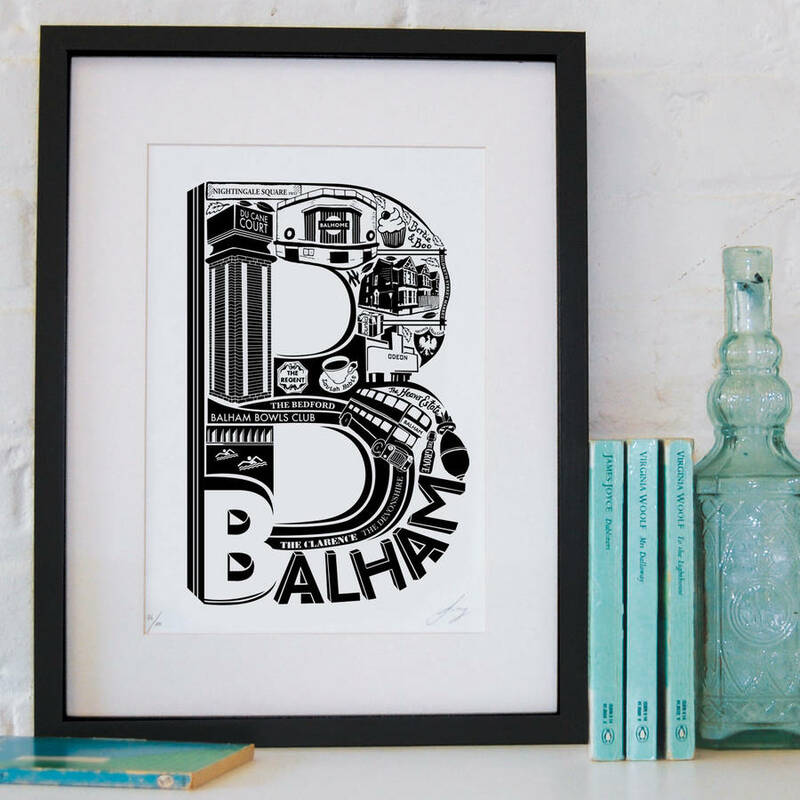 This poster would also be the perfect present for any Balham-dwelling friend. It makes an ideal housewarming gift, but could also be given as a birthday or Christmas present. 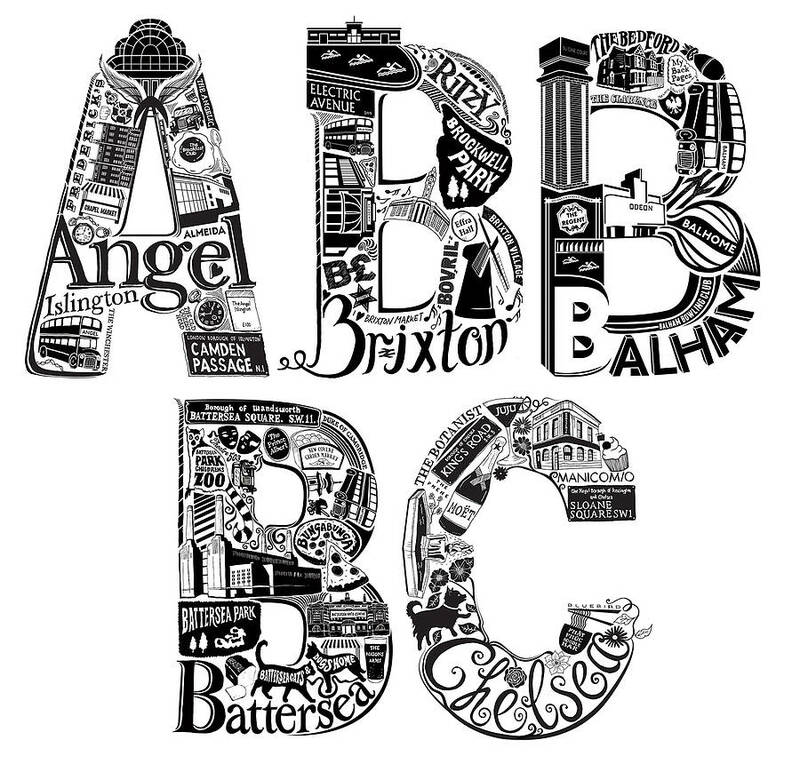 This print is part of a series of monochrome prints called the London Letters, each dedicated to a different London area. Other areas currently available are: Angel, Balham, Barnes, Battersea, Brixton, Camberwell, Camden, Chelsea, Clapham, Crouch End, Crystal Palace, Dalston, Dulwich, Ealing, Earlsfield, East Dulwich, Forest Hill, Fulham, Greenwich, Hackney, Hampstead, Herne Hill, Islington, Kensington, Kew, Kilburn, Leytonstone, New Cross, Notting Hill, Peckham, Pimlico, Putney, Queens Park, Richmond, Shoreditch, St. Johns Wood, Streatham, Soho, Tooting, Vauxhall, Walthamstow, West Norwood, Wandsworth and Wimbledon. 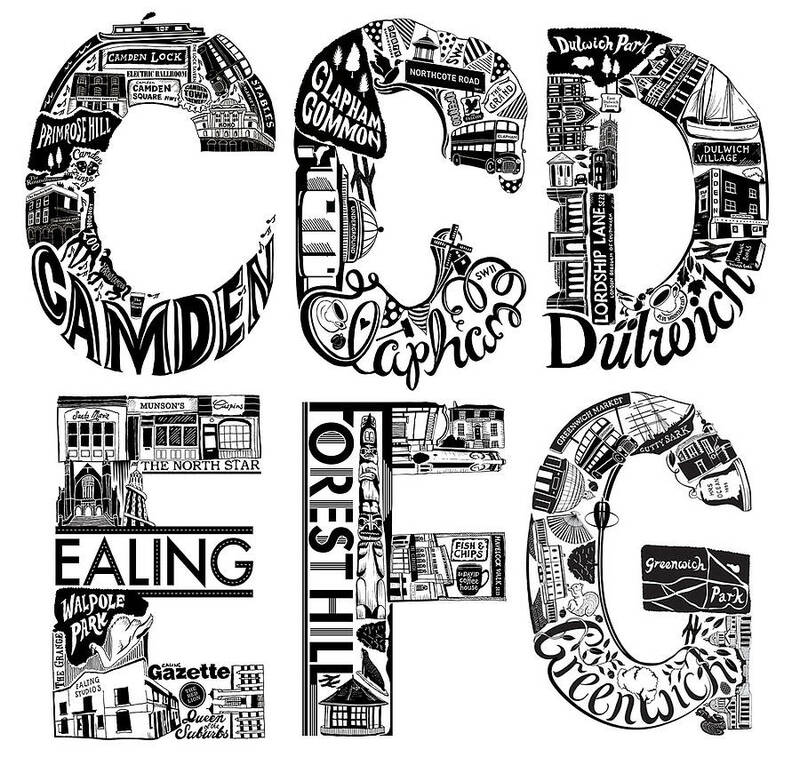 Also available is a print showing the Best of London, which incorporates important places and landmarks from across the city. This print is available in black. Hand-screenprinted in-house in the LucyLovesThis studios, using high-quality water-based inks that contain no solvents at all. The paper stock is 315gsm premium paper. Screenprinting is a craft and, as such, prints do vary, so each one is unique. This is part of the beauty of screenprinting. We offer a full professional framing service for our prints. They are made from solid wood, and handmade in the UK. We use high quality acrylic glazing that is indistinguishable from glass and is a safe option for artwork intended for children’s rooms. They are also professionally framed by hand in our London studio. Please note unfortunately we are unable to ship framed prints outside the UK. If you do order a framed print to be sent outside the UK, we will dispatch an unframed print and refund the cost of the frame. Unframed print: Your print is carefully packaged in a cello bag, before being mailed in a sturdy envelope. Framed print: Your print is carefully wrapped in bubblewrap, then packaged in a cardboard box.